Bunions are a pain. Literally. Wearing hiking boots (or any shoes) when you have a bunion can not only be uncomfortable, but painful. Pain when wearing shoes will cause you to miss out on time on the trails. Fortunately, we have some tips on how to fix a bunion without surgery. 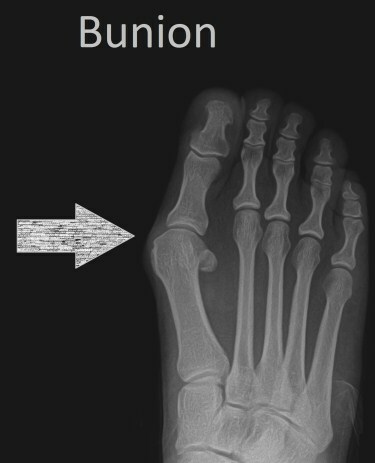 A bunion (doctors call it hallux valgus) is a bony growth that develops at the base of your big toe on the inside of the foot. Bunions can occur due to the bone or tissue at the joint that is located at the bottom of the big toe moving out of place. Over time, atypical motion and pressure on the joint will push the big toe to bend toward the other toes, creating a lump at the joint. Fortunately, bunions don’t have to slow you down. There are things that you can do to slow the progression of the bunion, alleviate the pressure and big toe joint pain, as well as limit its interference in the activities you love. While the exact cause of bunions is unknown, there are many ideas. There is some belief that certain foot types are more susceptible to developing bunions. Foot injuries or congenital deformities may also be factors. Some experts believe that certain types of shoes (tight, high heels, too narrow) may cause bunions or at a minimum contribute to their development. Individuals with arthritis, in particular inflammatory types like rheumatoid arthritis, may be more likely to develop bunions. There is some debate as to whether you can completely eliminate your bunion without surgery. Splints and exercises can improve the condition and fortunately there are ways to alleviate the pain you are experiencing. When you have a bunion, wearing the right shoes is important. This goes not just for hiking but for everyday footwear. Choose shoes that will offer plenty of space for not only your toes but the widest part of your foot. A wide, flexible sole that will support your foot is important and they should also be low heeled and comfortable. When choosing shoes with a back, the part that surrounds the heel should be sturdy so that your heel remains stable. Shoe inserts will work to position your foot properly and are available over the counter or as a prescription orthotic. The right insert will help align your foot properly, minimizing the pressure that your joint experiences. It is also helpful to use a moleskin or gel pad to protect the bunion from rubbing against your shoe. Splints are a helpful option for mild to moderate bunions. To be effective, these splints must be used on a constant basis over a period of time. A night bunion splint, for example, will be put on each night when you go to bed and taken off in the morning. The splint will help to correct the condition, realigning your big toe with your foot, as well as decrease the pain that the bunion is causing. You can even make your own. The following video will show you how to put on a night splint. Also, check out the Bunion “Bootie”, which is a soft splint that you wear all day with your shoes as well as to bed. The bootie is anchored at your ankle, gradually pulling your big toe away from your other toes. Wearing this soft splint will help to improve your balance and return some of the natural alignment to your foot. Toe spacers are another option for both bunions and bunionettes. Our favorite toe spacer product comes in a kit. It’s the Bunion Corrector & Bunion Relief Protector Sleeves Kit. Certain foot exercises can be helpful for those with bunions. Soaking your foot in warm water, icing it, ultrasound and massage can help to decrease the pain that you are experiencing as a result of your bunion. Nonsteroidal anti-inflammatories like aspirin or ibuprofen may also be helpful in providing relief for bunion pain. There are things that you can do that will help to prevent your developing a bunion in the first place. When choosing shoes, look for a pair with a wide toe box, with space between your longest toe and the end of the shoe. Avoid pointy shoes; if it looks like your toes will be scrunched up in them, they likely will be. Choose a shoe with low or no heels, as well as good arch support. Limiting activities that cause you to put a lot of pressure on your big toe may also be helpful; alternate activities like running and hiking with swimming and bicycling. Fortunately, surgery is not the only option when dealing with painful bunions and they don’t have to keep you away from the trails. Check out our review of the 6 Best Hiking Boots for Bunions for our recommendations.